“Food deserts” are neighborhoods where it’s hard to find anything to eat or buy that isn’t fast food or junk food. Well, there are plant deserts – neighborhoods where you rarely see any shrubs that aren’t yews, junipers, and forsythias – and concrete block rings around trees are more common than not. 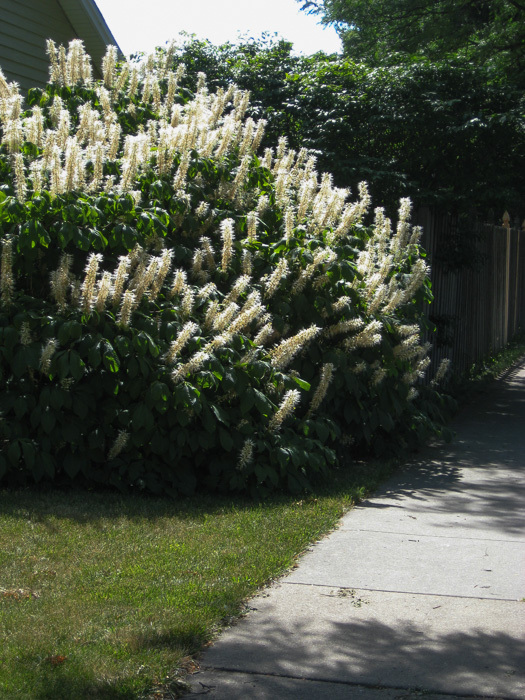 I was in such a plant desert when I saw this large bottlebrush buckeye. I’ll bet there’s an interesting story behind how such a spectacular plant found its way to this neighborhood. It was a hot, dry summer afternoon, and I was standing in a backyard in an old Arlington Heights neighborhood. I kicked at the dirt as I tried to figure out what to do with a parched, shady, perennial garden that consisted of a few astilbes clinging to life. Scattered Norway maple leaves were lying around in mid-summer decay. If there was a bench I would have taken a nap. There, among the dried-up maple leaves was a single leaf from a shingle oak! From whence did that blow in? I looked up, across, and into the neighbor’s back yard and there it was – a very large shingle oak tree. I felt like a miner who had just stubbed his toe on a gold nugget. I walked over and put my hand on the trunk. 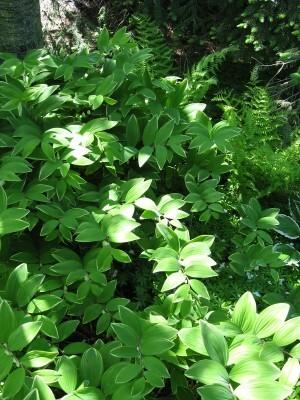 Here, in the land of silver maples and honeylocusts, was a very unusual native tree. I looked around. Another one, about 50 feet away! And another, about 75’ away in another direction in another backyard! And two more! I was standing in a grove of shingle oaks! They were probably left standing when the land was cleared for the first scattered houses that were built in this neighborhood in the 20’s, and they survived the more aggressive building that occurred in the 50’s.